This is a fun item. 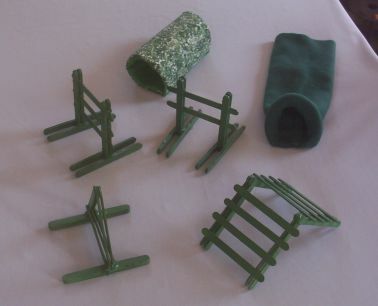 It is a GREEN seven piece, ready to go, Agility Set for Hamsters, Gerbils, or Mice/Mouse. You could also use this set for training young (small) rats/rat/ratties. This set include TWO JUMPS, one has three stationary bars and the other has two stationary bars. It has a cute little TRIANGLE HOOP JUMP, and a darling little "A" FRAME!! It also comes with a CLOSED TUNNEL and an OPEN TUNNEL. This set comes to you in a PLASTIC STORAGE CONTAINER to keep it all together and safe. The Closed Tunnel and Open Tunnel are hand or machine washable, air dry. The Plastic Storage Container is also washable, just wipe down with damp cloth.